Jesse Jackson, Jr. should speak about his mental illness. 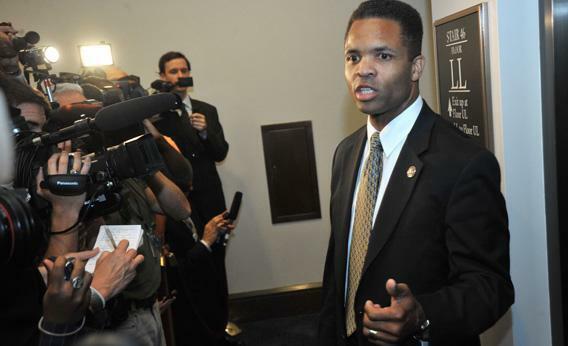 What the Jesse Jackson, Jr., case suggests about mental illness in America. Rather than putting the matter to rest, however, the brusque and somewhat vague statement only prompted more questions. The term “mood disorder,” as the Washington Post pointed out, can refer to a range of conditions, from the relatively mild dysthymia—a persistent, low-level depression—to bipolar 1 disorder, which can be debilitating and frightening for both sufferers and family. While it is important to respect a patient’s privacy, Jackson is missing a chance to perform a real public service. It is hard to escape the conclusion that his handlers have been reticent in part because of the pervasive stigma still attached to mental illness in this country—a stigma that, by remaining evasive, Jackson and his office are helping to perpetuate. Right now, Jackson and his family—especially his two children—are facing a wrenching ordeal. As I know from personal experience, it is alarming and disorienting to watch a loved one crash into a state of acute psychiatric illness. According to the statement from his unnamed doctor, Jackson has suffered from this mood disorder for some time, which makes sense: Bipolar disorder, for instance, has an average onset of 25, though it’s often not diagnosed until later. (Diagnosis in young children has risen sharply in recent years, but it’s controversial.) So it’s likely that for years Jackson and his family have dreaded such media glare. And though they may be cursing their prominence, they should feel thankful in at least one important regard: Jackson is likely getting some of the best possible care. If he entered a facility on or around the start of his leave June 10, then he has been in treatment for a month—practically an eternity in today’s health care environment. While you still encounter jokes in movies and television about “committing” someone for life, that has been exceedingly rare for some time, thanks to the deinstitutionalization movement. That movement was favored both by politicians like Ronald Reagan, who saw it as a cost-cutting measure, and by advocates for those who suffer from mental illness, who believed that community-based treatment could be more effective and more humane. In recent years, cash-strapped states have continued to cut funds for psychiatric patients’ care. In February, for instance, Alabama announced plans to shutter most of its facilities by the spring of 2013. Last fall, Vermont officials struggled to find beds for 51 very ill patients after their hospital was left unusable after flooding caused by Tropical Storm Irene. Jackson’s home state of Illinois reduced general funds for mental health by 31.7 percent—or more than $113 million—between 2009 and 2011, according to a report by the National Alliance for the Mentally Ill. The result: On average, hospitalizations for the mentally ill last just 7.5 days. And this isn’t entirely a bad thing. It’s not fun to be in a psychiatric facility, whether as a visitor or a patient. The idea is to get people stable so they can return quickly to society. But that isn’t always enough time. Jackson, it would appear, has the unusual benefit of recovering at the speed his doctors deem necessary, rather than being limited by insurance companies or state resources. Because the primary goal of hospitalization is stabilization, the apparent duration of Jackson’s stay suggests that he is dealing with significant problems—hence his doctor’s ambiguous use of the term “mood disorder.” That seemingly calculated vagueness hints at another divide in the way mental illness is treated in this country—not by doctors, but by the rest of us. Just as there are separate facilities for the rich and for the rest, there is a gulf in the relative stigma of different kinds of mental illness. There are palatable, almost chic diagnoses, and then there are those that still scare many people. Fortunately, it has become OK for most people who suffer from mild depression or anxiety to publicly acknowledge these conditions. But other diagnoses, like bipolar disorder and schizophrenia, are a different story. They remain taboo. After a drug-related car accident in 2006, another political scion, Patrick Kennedy, publicly revealed his history of mental illness and substance abuse. He was nevertheless re-elected to Congress before retiring a few years later. Kennedy was diagnosed as bipolar in the 1980s, but he said in 2011 that he since been diagnosed with “a different, unspecified disorder,” according to CNN. While it’s important to note that psychiatric diagnoses are not permanent, and doctors can and do disagree on them, the fact that Kennedy, an outspoken advocate for the mentally ill, declines to share his precise diagnosis appears telling. (Consider that when Catherine Zeta-Jones announced that she had bipolar disorder—a disclosure I cheered—she was careful to note that she suffered from bipolar II, a less severe form.) Historians may like to diagnose former politicians—from Abraham Lincoln to John F. Kennedy—with mental health problems, but it’s difficult to imagine a member of Congress who has experienced a psychotic break being eager to share that information. Should Jackson have been honest from the get-go? I think so. It would have served at least two purposes. First, it would have been another step toward removing the stigma that still surrounds mental illness. I also believe his constituents deserve to know. While mental illness is nothing to be ashamed of, when a person is in an acute state, their judgment and job performance can be affected. Earlier this week, the Rev. Jesse Jackson, Sr., said that at “the appropriate time,” his son would “share with the public that which he feels they should have.” I hope that this is true—that once healthy, Jackson will speak candidly about his health. That will help his constituents. It may also help the millions of other Americans suffering from mental illness feel a little less alone.